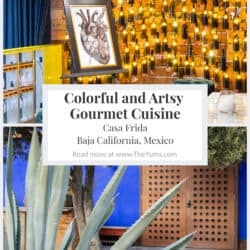 The complete sensory experience offered at Casa Frida is an exciting introduction to wine production and fine dining in Baja California, Mexico. Menu: Part of the Slow Food movement, Asador Campestre is the restaurant in the Casa Frida complex where the seafood, pork, lamb, and steaks are carefully prepared and served. For vegetarians, the menu includes roasted beet salad, sautéed vegetable tostadas, and roasted corn. All dishes are artfully presented and so pleasing to the eye. Frida Wine Tasting proudly boasts having five labels and five types of boutique wines that are lovingly and romantically described. 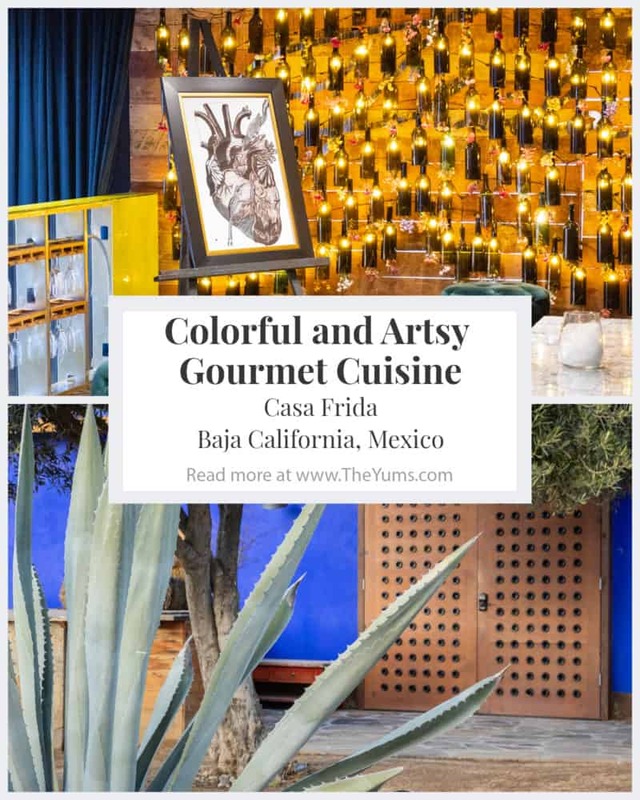 Thoughts: The Casa Frida in Baja California is a whole new experience for art fanatics in Valle de Guadalupe and will draw visitors from all over the world. The complex consists of two vacation homes and a tasting room called “Frida Wine Tasting.” Designed by artists for artists it is located where the first chapel in the valley was over 70 years ago. Mexican culture, architecture, music, and of course, wine inspired the concept. The colorful buildings and Frida Kahlo artwork make this richly picturesque location special on the Wine Route in Baja California, Mexico. Their slogan “From Art to Wine” is evident in the decor and extends to the food and wine. Lively music drew us upstairs to the restaurant, Asador Campestre, where the fusion gourmet cuisine is served. The dance floor was empty but that was only because we were concentrating on the meal. The potbelly stove and food prep counter are open to the room where one can watch the team precisely create their diverse menu. 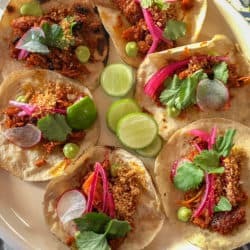 The crisped taco becomes the base with the meat laid on, then delicate fresh vegetables are picked up with chopsticks and artfully arranged on each dish. As a result, it’s like watching a painting come to life on the plate. A very generous serving of ceviche, which is fresh raw seafood marinated in citrus juices and flavored with spices, was the first dish on our tasting. Served in a bowl with a paper-thin radish slice and a fragile purple flower as a garnish was my favorite. Roast suckling pig tacos decorated with fresh cilantro, thinly-sliced vegetables, and clean, puckery limes composed our second course. They were more flavorful than any I’ve had before. The wine tasting that accompanied this event included a lovely rosé, light, and crisp Chardonnay, and a full-bodied, fragrant Syrah. Each bottle was labeled with specially designed artwork – confirming that the Casa Frida experience begins with art and ends in wine. Price Range: Appetizers (that could be a meal in themselves) are $29, entrees from $37 to $81, and desserts are $21. Vegetarian selections range from $12.50 to $35.00 USD. Pricing on the menu is in pesos. The pricing listed here was converted at 0.052 pesos to the dollar. Disclosure: Casa Frida was one of the stops on my press trip through Valle de Guadalupe. They treated us to the delectable fare and wine tasting.